Ali Wolff and Casall. Photo: The Book LLC. Devon, Pa. – May 29, 2018 – The Dixon Oval welcomed its first international show jumping competition at the 2018 Devon Horse Show and Country Fair on Tuesday evening with the $50,000 Jet Run Devon Welcome Stake CSI4*, sponsored by 5R Farms LLC – Helen Rich. Thirty-two horses and athletes went head-to-head for the first place prize, but it was USA’s Ali Wolff who risked it all to come away with her first Devon jumper win aboard Blacklick Bend Farm’s Casall. The championship tricolors for the professional hunter divisions were awarded on Tuesday in the Dixon Oval at the iconic Devon Horse Show, and in the Green 3’6″ Hunters, it was Hunt Tosh and Douglas Wheeler’s Bastogne who took home top honors. To finish out the evening in the Dixon Oval, the Single Horse Driving division took place with nine entries. The Devon blue was stolen by P. J. Crowley after accumulating the most points in the Single Horse Pleasure Driving Turnout and the Single Horse Scurry. Reserve champion was captured by Steve Wilson in his Brewster County Gig carriage. Wellington, Fla. – Ali Wolff made the most out of showing her mount Casall in his first week of competition at the Winter Equestrian Festival. They helped the Hermès U.S. Show Jumping Team earn a Silver medal during Friday’s Nation Cup competition and finished the week by placing third in the $216,000 CSIO4* Grand Prix presented by Lugano Diamonds on Sunday. As on Friday, the Irish had luck on their side as Shane Sweetnam and Conor Swail placed first and second, respectively. As a result of Wolff’s efforts over the week, she earned the Leading Lady Rider Award. “I’ve had him [Casall] since he was seven, and I have been moving him up the ranks. He has a bright future ahead of him, and he has been phenomenal for me and my career,” said Wolff. A group of 43 combinations attempted the Ken Krome-designed course. 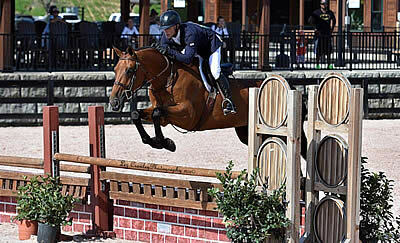 Wolff (New Albany, Ohio) and Casall, Blacklick Bend Farm’s 2005 Holsteiner gelding, made it through the first round comfortably, joining 17 combinations, including seven other Americans, in a tricky jump-off. A troublesome turn around a palm tree leading into the Hermès oxer, fence five, caused problems for several combinations early in the jump-off. Through five combinations, Great Britain’s Jessica Mendoza and Toy Boy had the early lead with a time of 43.21. Wolff and Casall followed Mendoza. With caution, the pair tackled the Hermès oxer. Once past this difficult spot, they picked up the speed and crossed the finish two-tenths of a second ahead of Mendoza. “Going early on [in the jump-off] is a little hard because I had 10 people behind me. I just had to go in knowing my speed and try and push a little faster than that. I started off with the pace I wanted and was able to finish on the same pace. Everything came up naturally. He was really good for me,” said Wolff. Going 10th, Sweetnam and Chaqui Z jetted through the course to overtake the top spot with a time of 41.79. Four-time Olympian Beezie Madden (Cazenovia, N.Y.) and Coach, Abigail Wexner’s 2008 Holsteiner gelding, moved Mendoza and Toy Boy to fourth place on a time of 43.11 seconds to sit in third place after 15 combinations. Swail and Rubens Ls La Silla knocked Madden and Coach to fourth with a time of 41.82. As the final combination to go, Olympian Lauren Hough (Wellington, Fla.) and Waterford, Laura and Meredith Mateo’s 2003 KWPN gelding, had a rail, ensuring Wolff a podium position. Ali Wolff and Artemis. Photos ©Sportfot. Mill Spring, NC – June 7, 2015 – On the final day of the successful Tryon Spring Series at Tryon International Equestrian Center (TIEC), Ali Wolff (USA) and John Wolff’s Artemis secured a win in the $34,000 FEI Tryon 1.50m Challenge, finishing the jump-off in 42.012 seconds. Scott Keach (AUS) and Southern Cross Equestrian, LLC’s Viriato followed in second, crossing the timers in 43.984 seconds. Kristen Vanderveen (USA) and Bull Run Inc.’s Bull Run’s Eternal rounded out the top three, completing the jump-off in 44.025 seconds. 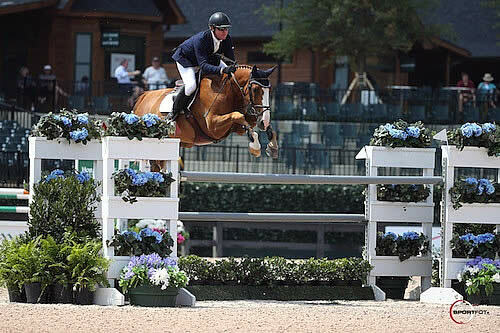 The Tryon Spring Series hosted two weeks of FEI competition, the first two occasions on which international competition had been hosted at the facility. The Tryon Summer Series will begin on Wednesday, June 24, and will host four consecutive weeks of FEI competition at TIEC. Artemis jumped beautifully throughout the class, adding another top place finish for Wolff, who has been incredibly consistent during her time at TIEC. A second place finish in last night’s $210,000 Tryon Grand Prix for the Governor’s Cup presented by Rolex was a true highlight for the 25-year-old Columbus, OH native, as was her growing consistency in the international ring. The 2005 Anglo European mare (Chamberlain Z x Odette) has not been an easy ride for Wolff, but has taught her to be patient and careful in the ring. The pair has been together for nearly eight years, and Artemis is beginning to shine for Wolff. Artemis joined the Wolff family like most of the other horses in her string, young and talented. The enjoyment of producing younger horses and bringing them up the ranks herself is something that she always looks for when adding to her team. Wolff plans to travel to Spruce Meadows in Calgary, Canada, and Artemis will be a key component in her competition plans for the next several months. They will then head to Europe to contest Hickstead and Gijon before returning to the States later in the summer. As for Wolff herself, the goal remains the same, representing the United States in team competition. Her performances throughout the week have served as a testament to her continued and growing talent. Gaining international experience will be a key piece of Wolff’s future success, and her competition schedule for the rest of the year was created with that in mind. For more information and a full list of results, please visit www.tryon.com. Please “Like” the TIEC Facebook page at www.facebook.com/tryonresort to be eligible for various contests and promotions. Coapexpan (MEX), 24 April 2015 – Team USA won the third leg of the Furusiyya FEI Nations Cup™ Jumping 2015 series at the Coapexpan Equestrian Club in Xalapa, Mexico today, where Team Mexico I put up a brilliant performance to finish a close second and Mexico II lined up third ahead of Canada in fourth place. Great course design by Brazil’s Guilherme Jorge provided a fascinating contest. Wolff said this evening, “Gui did such an amazing job; he allowed the horses to get comfortable over the early fences, then the water rode longer than it looked, and after that it got more technical. There were oxers going uphill, and there was an awkward angle to the last,” she explained. The open water at fence five was 3.8m wide, but the majority of faults were racked up on the later part of the track, with the 1.60m-wide oxer at fence nine proving one of the main bogeys of the day. “It was uphill and wide, and horses had just landed off a short triple combination so you had to open them up again. It was a long nine (strides), and it was easy to get either too far off and get the back bar, or too deep and catch it in front,” Wolff said. Riders then swung left-handed to the final line that began with pale green planks followed by a double – oxer to vertical – before bending left again for the final oxer at fence 12 with its green poles and a bright blue water-try underneath. Several made it all the way without incident only to fault here. The two Mexican teams, however, were sharing runner-up spot and were just one fence off the leading Americans at the halfway stage with eight on the board. Clears from both Wolff and her 10-year-old gelding who jumped like a cat, and anchor partnership Brianne Goutal with Nice de Prissey, ensured Team USA had to count only one of the single errors made by pathfinder Candice King (Kismet) and second-line rider Callan Solem (VDL Wizard) to hold the lead on a four-fault tally. “This was a fabulous course – great credit to the course designer,” said US Chef d’Equipe, Robert Ridland. “Walking the course out there it was obvious that it was not a level field in the arena; there are places that are higher than others so the course designer was clever enough to play around with that. Having said that, the footing is the best I have seen in the world and the horses would definitely second that. It really was a true Nations Cup course out there; it ticked all the boxes,” he said. He said his was a “special” team. “We had a great dinner last night and underlined the importance of winning today. Qualifying for the Nations Cup Final was absolutely key for us, and definitely extremely high up our priority list for this calendar year. We wanted to win our division. I couldn’t be prouder; that was an amazing performance!” he declared. For further information on the third leg of the Furusiyya FEI Nations Cup™ Jumping 2015 series at Coapexpan, Mexico, contact Press Officer Anwar Esquivel, Email anwaresquivel85@gmail.com Tel +521 555 101 3898. The fourth leg of the series will take place at Lummen, Belgium on Friday 1 May. For details of the Belgian fixture, visit www.csiolummen.be or contact Press Officer Edith de Reys, Email edr.press.service@gmail.com or Tel +32 475 659281. 3 countries – Canada, Mexico and USA – were battling for the two qualifying spots available for the Furusiyya FEI Nations Cup™ Jumping 2015 Final which will take place in Barcelona, Spain in September. Just one double-clear in the competition, from America’s Ali Wolff and Casall. Furusiyya FEI Nations Cup™ Jumping 2015 North America, Central America and Caribbean League – Final Standings here. Darragh Kerins and Decia Van Het Molenhof. Photos by: Kendall Bierer/Phelps Media Group. 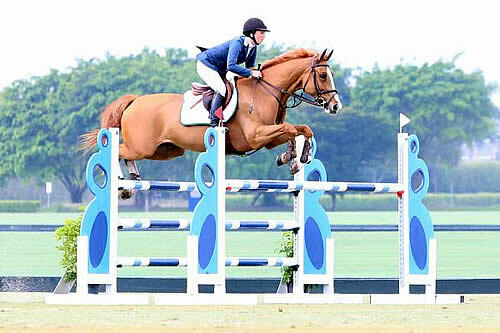 Wellington, FL – January 29, 2013 – Although the clouds hung dauntingly overhead, a field of 38 competitors warmed up for the fourth week of the Ridge at Wellington’s Turf Tour. Held at the International Polo Club Palm Beach, the 1.30m-1.35m Jumpers saw top international riders contend for the top spot in today’s two classes. Ireland’s Darragh Kerins rode to the pinnacle of the ranks during the first class, while Ali Wolff took the victory in the second class of the day. Jeffery Welles claimed the early lead as the first rider of the day. He navigated Pierre Jolicouer’s course with finesse aboard Bilion, riding to a double clear effort in 40.870 seconds. Ireland’s Kevin Babington and Baloucat soon bested the pair with a faultless jump off in 39.051 seconds. The speed only continued as each consecutive rider outdid the next. Kerins entered the ring and set a time that none could catch. 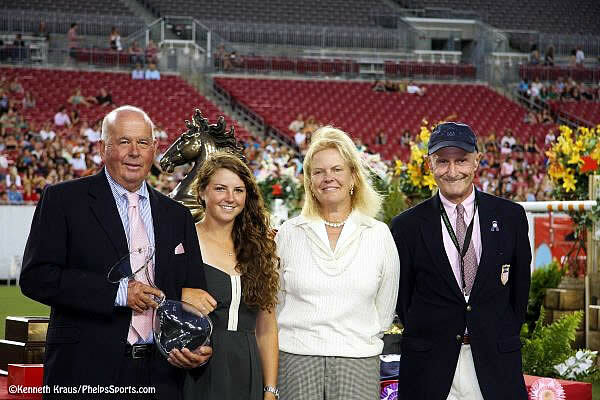 Decia Van Het Molenhof is a new mare for Kerins, but that did not put a hinge in his plans. He took the inside turn between fences 1 and 2 to shave the seconds, and then used her quick pace across the ground slide into the lead in a time of 34.267 seconds. The 11-year-old mare kept her focus inside the arena, and tackled the track with ease. Last week’s winner, Samuel Parot, took the second place position, but was still three seconds shy of Kerins speedy round. Jeffery Welles and Antaris S captured the third place in 38.132 seconds. Molly Ashe Cawley and Cocq A Doodle were the first to tackle the second track of the day. They took an early lead in the class with a double clear effort in 37.134 seconds. Parot returned to the ring aboard Option D’auge to set the pace at 36.041 seconds to take over the lead. Speed was the name of the game as riders traversed the turf, with seven of the 11 horse and rider combinations going quick and fast. Babington and Baloucat took over the lead in 33.536 seconds, but Ali Wolff had her sights set on the win. Wolff piloted Brianda, her most recent mount, to the top of the leader board with an untouchable time of 32.949 seconds. The 9-year-old mare was able to turn with nimbleness as they navigated the serpentine of the jump off. Babington and Baloucat were awarded the second place, while he also guided Cord 11 to the third place finish. Jonathan McCrea and Brugal VDL rode to the fourth place, and Sarah Wayda and Spargel captured fifth. Parot and Option D’auge rounded out the top six. The stakes are increasing each week as top riders, amateur and professional, vie for their invitation to the $24,750 1.40m Invitational Grand Prix Series Finale on Saturday, March 22, 2014, as well as the coveted Leading Rider Bonus. The Wellington Turf Tour will return to the Schuyler Riley’s Wolfstone Stables next week for the Wednesday and Friday events, but will return to the International Polo Club Palm Beach on a date to be announced soon. The Friday event will run from 8 a.m. to 4:30 p.m. Riders are encouraged to get their entries in as soon as possible for the approaching classes. Turning in entries early will ensure that they get the time that they desire. Show Net will provide the live scoring for the Ridge Winter Tour II, as well as video all rounds. All recorded rounds and results are available at: www.shownet.biz. The Ridge still has available sponsorships for the Invitational Series. For more information, call (908) 500-0996 or download information at http://www.theridgefarm.com.